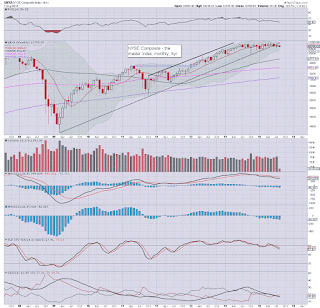 US equity indexes are increasingly weak, with provisional breaks of core rising trend in most indexes. Transports continues to lead the way lower, with the Dow and other indexes now following. 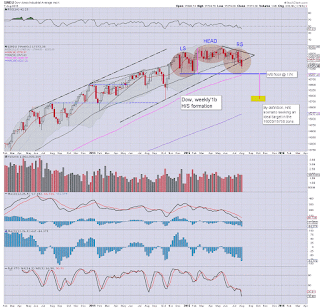 The US market looks set for significant weakness into late Sept/early Oct. 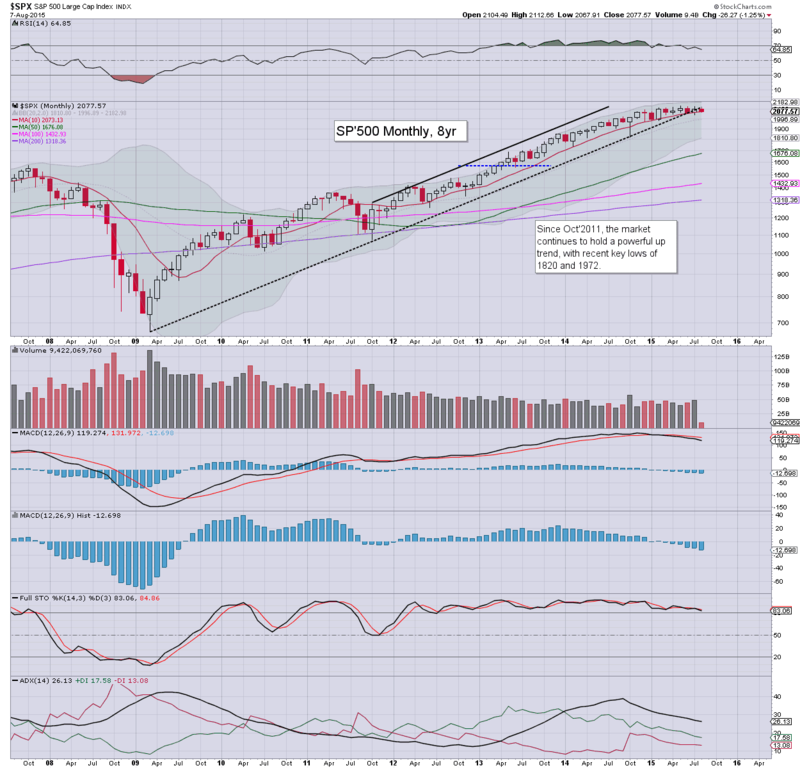 The sp'500 settled the week at 2077, having seen an initial break of the 200dma (2073). 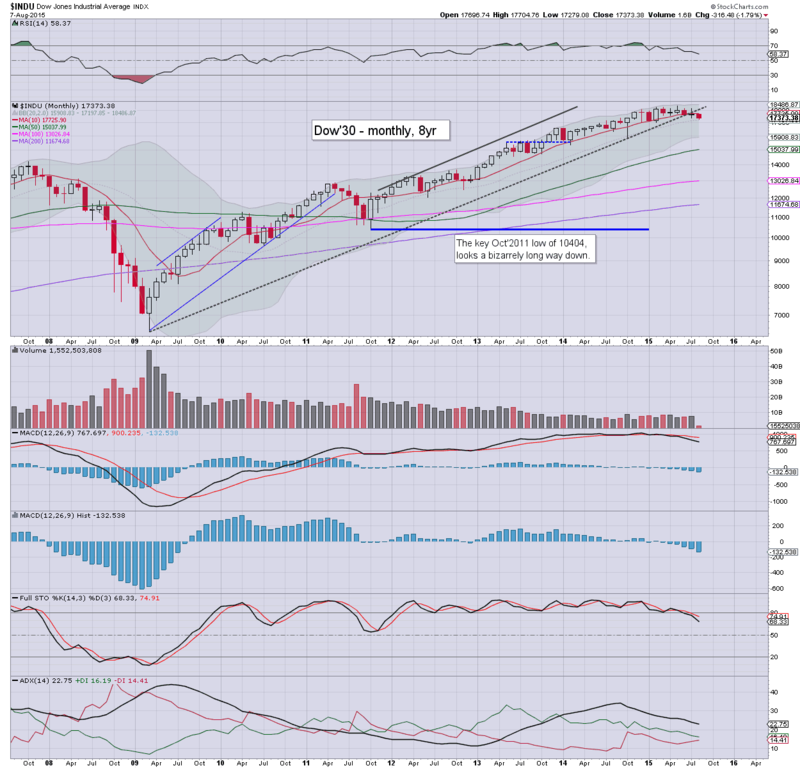 Further downside looks due to the 2040s.. which will likely equate to Dow 17K. A bounce of 2-3% then looks due, back into the 2075/2100 zone. The next wave lower in late Aug/early Sept' should see a key break of the 2000 threshold... with viable downside to the low 1800s. Sustained action <1800 looks extremely unlikely, and best guess is that the US (and most other world equity markets) will rally from October onward... and across much of 2016. 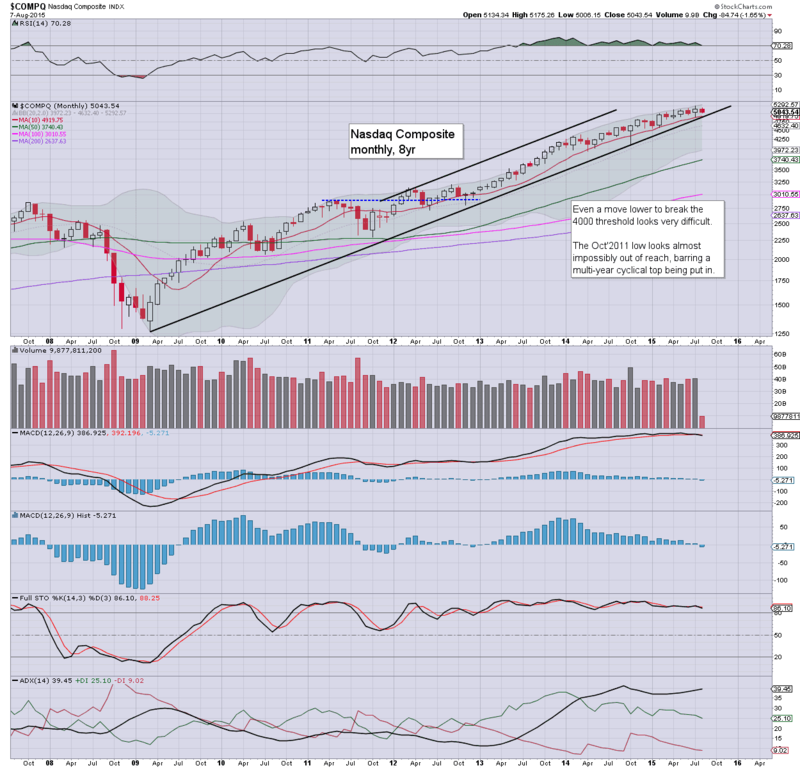 The Nasdaq comp' continues to cool from the July high of 5231, settling the week at 5043. Underlying MACD (blue bar histogram) cycle is negative for the first time since Dec'2012. First target is a break under rising trend.. currently around 4900. From there, primary target is around 4000... which is a clear 20% lower. 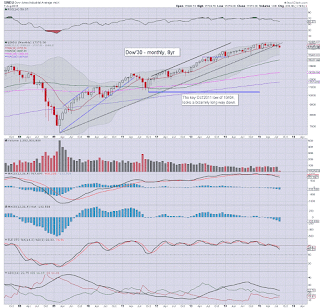 The once mighty Dow has likely maxed out for the year at 18351, and is set for the 17000 threshold in the near term. 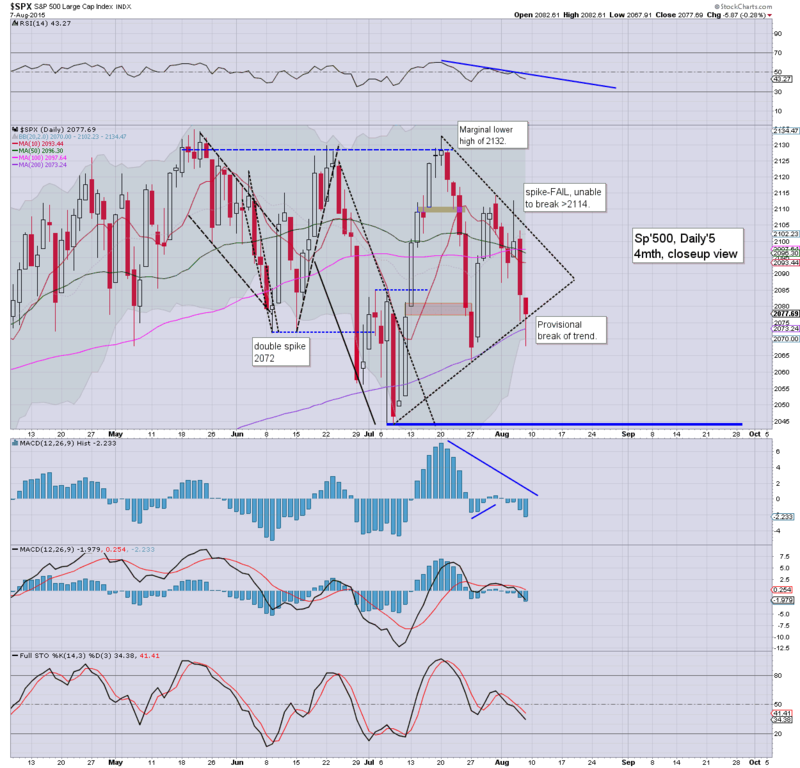 After any bounce, more significant downside looks probable across September to the 16500/16000 zone. 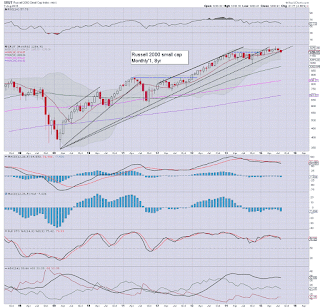 The master index continues to cool, and looks set for the 10250/10000 zone within the next two months. Sustained action <10k looks difficult. 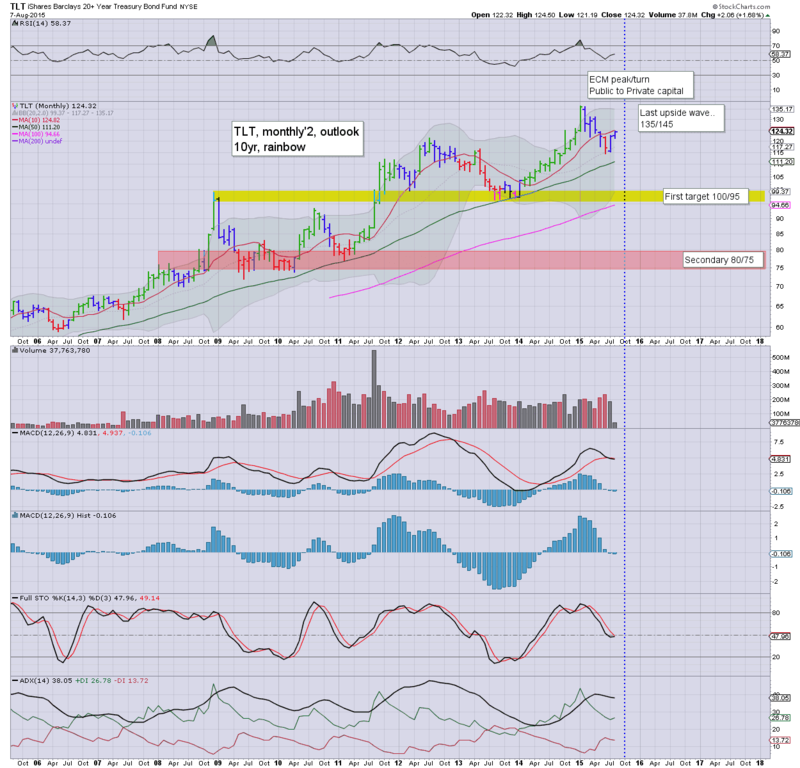 Next support <10K is not until the 9000/8500 zone.. and that would arguably equate to sp'1850/00. 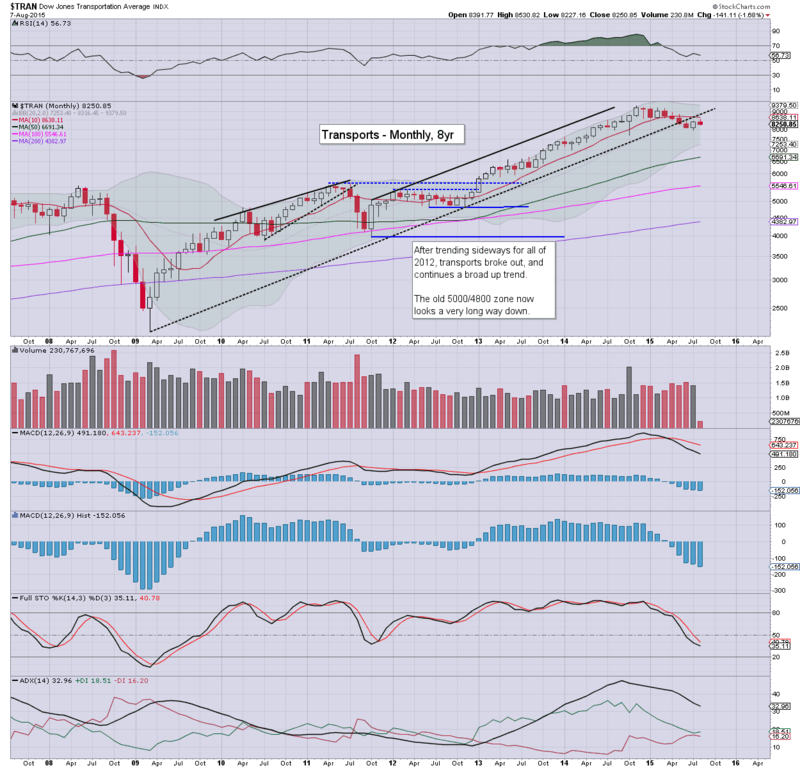 The second market leader - R2K, has broken the core trend, and looks set to broadly decline to the 1100 threshold. 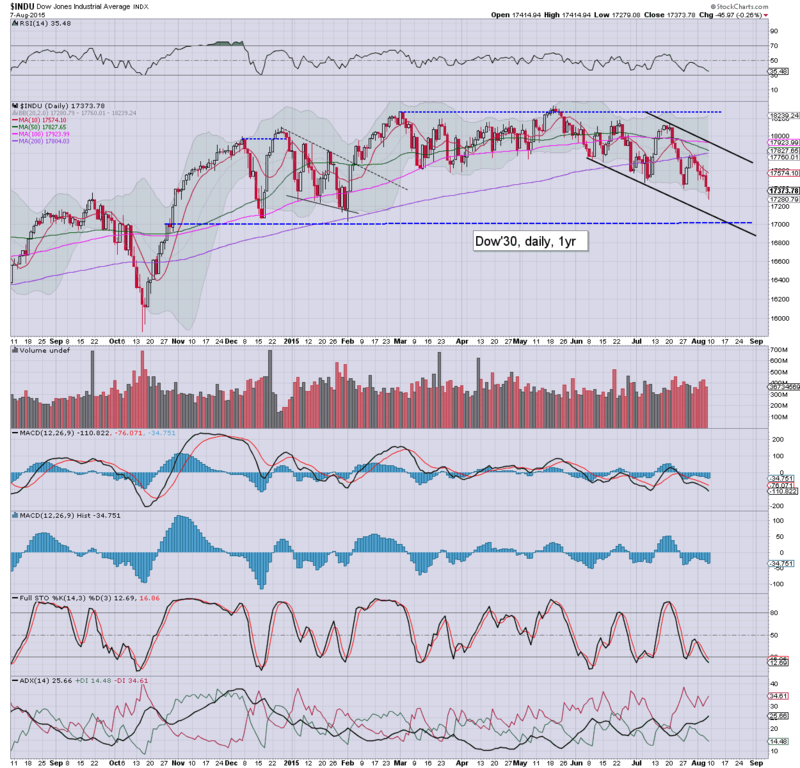 Sustained action under the Oct'2014 low of 1040 looks very difficult. 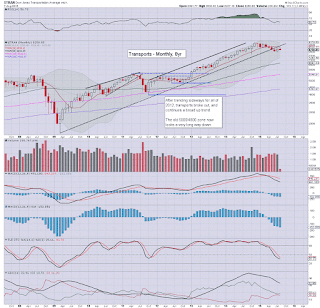 Despite a net July gain, the Transports 'old leader', is back on the slide, and is currently -1.7% so far this month. 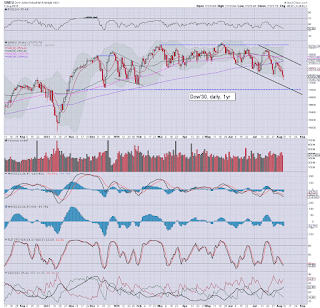 Further downside to the 7500/250 zone looks due.. which would likely equate to sp'1900. 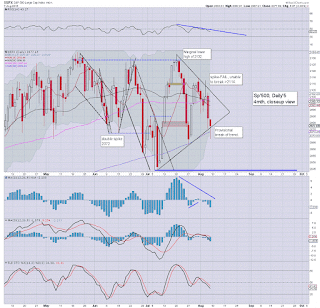 Sustained action under 7K looks extremely difficult, not least as the MACD cycle is already on the low side. 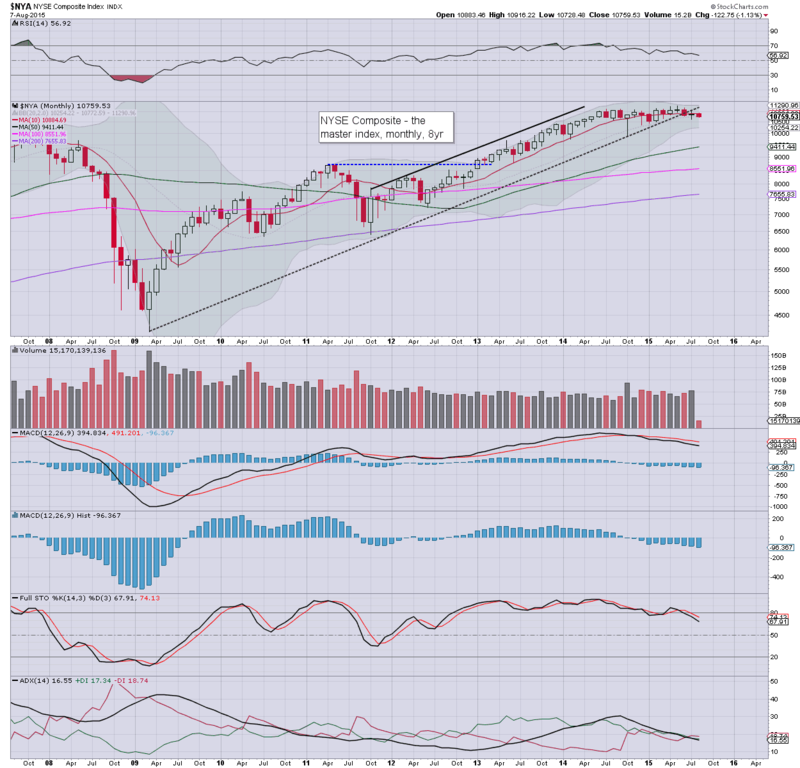 All US indexes look to have maxed out for the summer.. if not the year. Considering recent price action and structure, the market looks to be in the early phase of a significant correction. The only issue is whether we floor in the sp'1900s.. or the 1800s. On no 'reasonable outlook' can I see the US market sustainably trading <1800. Lets be clear... the QE continues (via the ECB and BoJ), along with share buybacks, and interest rates which will remain relatively low for years to come. 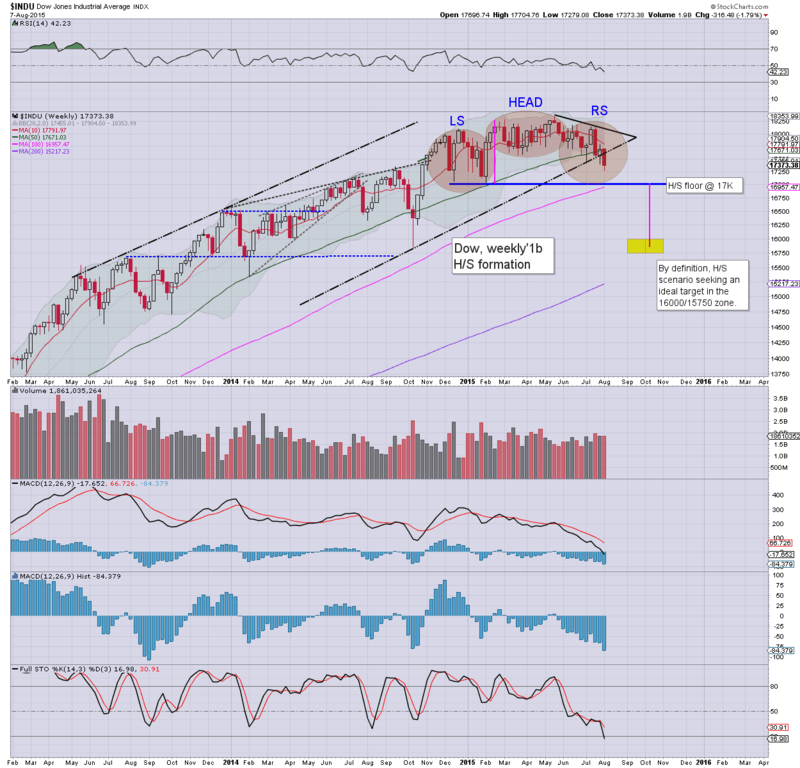 The 17000 threshold looks an obvious target next week... and then a bounce of 2-3%. 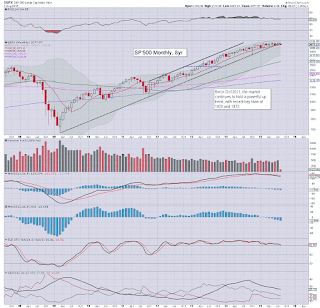 From 17400/600 zone... more powerful downside <17K... perhaps flooring in the 16250/16000 zone in late Sept'/early Oct'. *Fed officials Lockhart and Dudley are set to speak on Monday and Wed' respectively. Whilst equities ended the week moderately lower, there was more notable action in the US bond market. 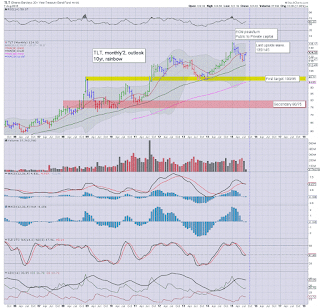 The ETF of TLT settled higher by a significant 1.3% @ $124.32. 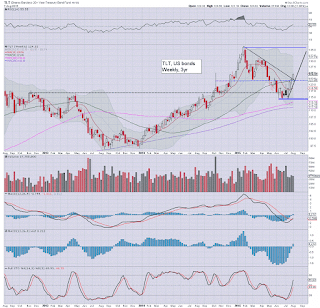 The near/mid term trend is unquestionably now bullish into late Sept/early Oct.
*I realise many have little concern about the bond market, but there are some truly grand implications.. as those who follow Armstrong will be well aware of. TLT looks set for the $130s.. the only issue is whether we see a marginally lower high <135.. a double top, or a divergent higher high >135. 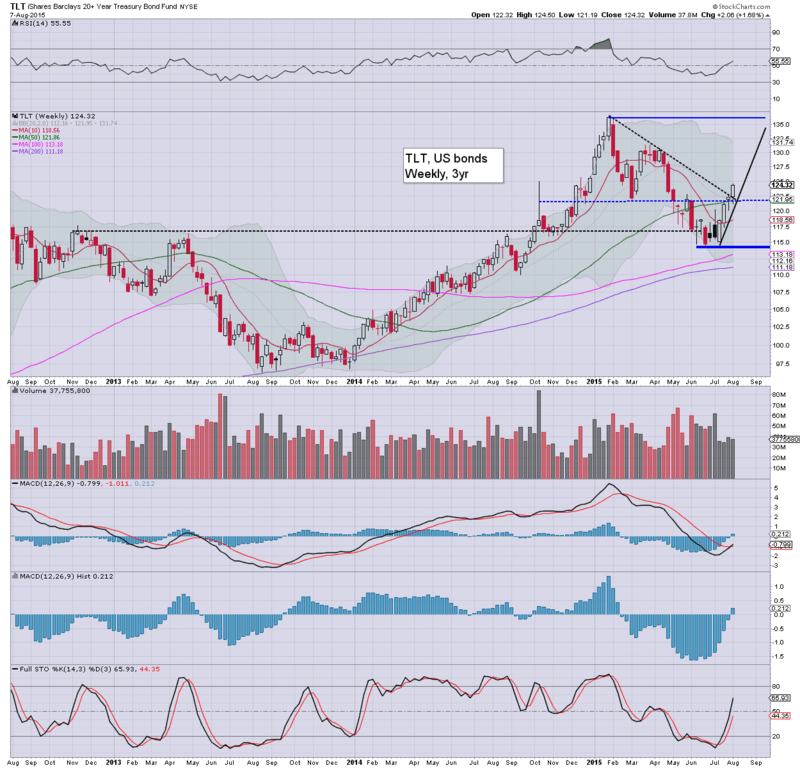 My guess would be a double top, but regardless, I will look to be short TLT from early Oct' onward. 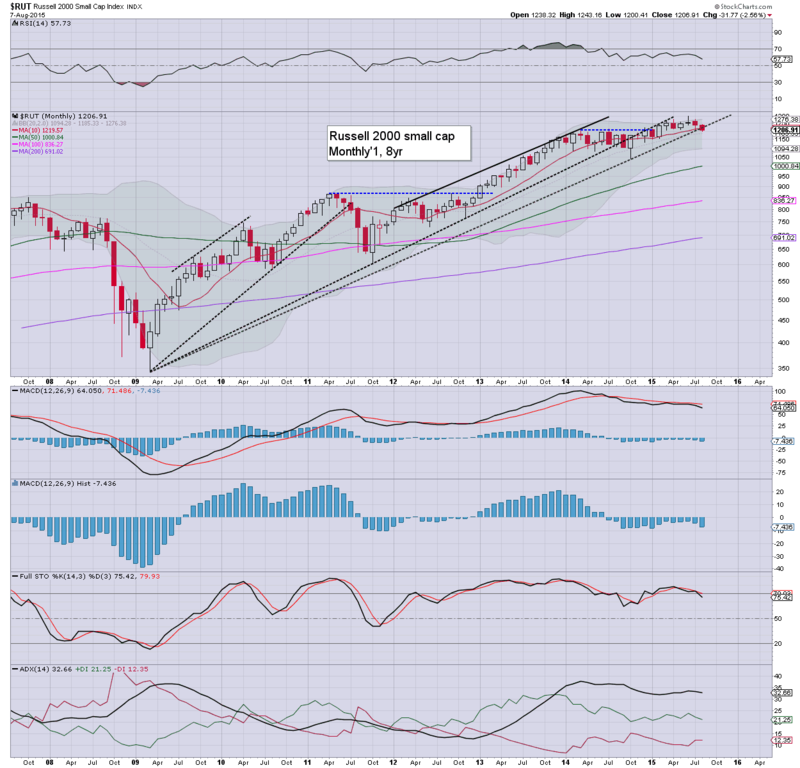 US equities closed broadly weak, sp -5pts @ 2077. The two leaders - Trans/R2K, settled lower by -1.4% and -0.7% respectively. 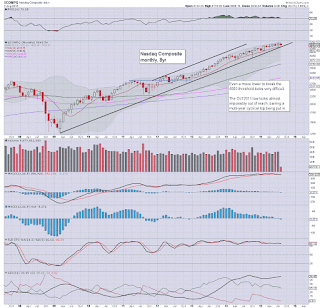 Near term outlook is for continued downside to Dow 17000, along with sp'2040s, and that should equate to VIX in the 16/17s. From there.. a bounce looks highly probable. *a very notable 7th net daily decline in the Dow, the worse streak since the collapse wave of July/August 2011. The Dow has closed lower for 12 of the last 14 trading days.